Most territorial banks never issued a denomination this high. So these are scarce today; only about 15 are known to exist. Every few years another one is found, but they will always be scarce. 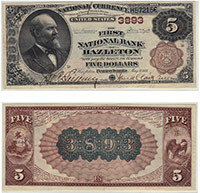 The exact value is based on the condition and issuing bank's rarity. Please contact us if you need an exact price quote. Don't forget to check the serial number. Number 1 notes always sell for nice premiums.